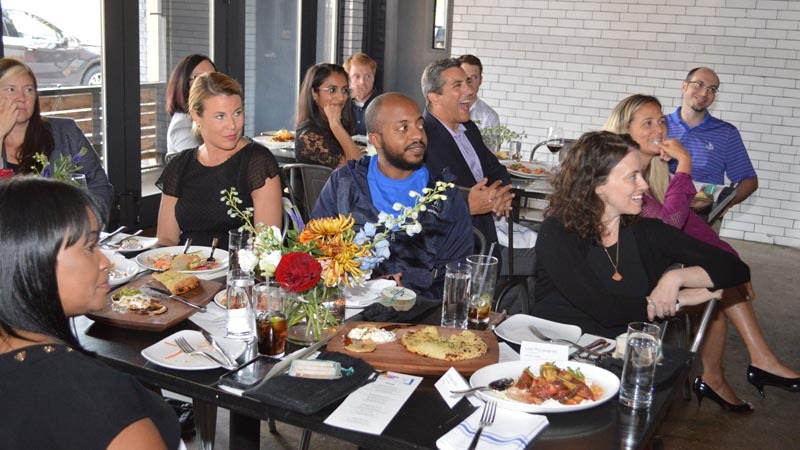 Through the Table Talk Dinner Series, Comcast NBCUniversal’s Entrepreneurial Engagement team takes us across the United States to meet tech entrepreneurs who build innovative products and influence startup culture in their cities. Authentic conversations between founders and product and innovation leaders at Comcast NBCUniversal helped create this series of stories about cities, like Detroit, where tech and entrepreneurship is thriving. It’s been more than 120 years since Charles Brady King test drove the first automobile made in Detroit down Saint Antoine Street. Today, the city’s culture and pedigree of innovative engineering, design, and steadfast entrepreneurship continues to thrive in a diverse and inclusive community where founders from all backgrounds can find success. Recently, local entrepreneurs and community leaders joined startup champions from Comcast NBCUniversal for an in-depth discussion on the future of innovation in the city. Attendees agreed that the variety of businesses sprouting up in Detroit is comprehensively unique. Detroit’s recent revival is well-documented and much of it can be attributed to the role of Motor City entrepreneurs in sectors such as technology, manufacturing, and food. “There is also a lot of entrepreneurship in non-tech sectors in Detroit that are building jobs and employing people from backgrounds that are often overlooked within the tech ecosystem. I think that’s part of the Detroit revival story that’s often left off the agenda,” said Rachna Govani, founder of Foodstand, a community-based app that helps users build healthy eating habits. Indeed, the city’s manufacturing and automotive heritage continues to play a massive role in Detroit’s renaissance and entrepreneurial culture. Shiva Bhardwaj grew up in his dad’s auto service center and saw firsthand the transition to electronic systems in vehicles and how it impacted the automotive technician industry. After internships with top companies in Silicon Valley, the Ontario, Canada native came to Detroit to found Pitstop, an inventive device and platform that performs and reports diagnostic tests on cars, making it easy for technicians to quickly assess and service cars. Making a positive impact on people’s lives is also an intrinsic motivation behind Detroit’s entrepreneurs. Matt Gira, founder of Fathom Drone, a smart underwater drone, said Detroit’s startup scene changes fast and often. Having a global leader like Techstars in the city, in addition to strong local resources like TechTown, help the ecosystem grow and thrive. TechTown, Detroit’s longest-standing entrepreneurial incubator, is working toward providing inclusive resources for any and all up-and-coming founders. TechTown’s office space supports 160 businesses from a wide array of industries, while servicing more than 400 clients with a full suite of entrepreneurial resources, labs, and events. Another strength lies in the city’s rich diversity. The Detroit-area is one of the most heterogeneous in the country, boasting large African-American and Middle Eastern populations. Many Detroiters are working to match that diversity in the startup community. Detroit startup leaders, though, are looking to push diversity beyond the make-up of founders and staff.